In 1558, talented military chief named Nguyen Hoang got Le King’s permission to be the defender of the Thuan Hoa region, which included Quang Binh, Quang Tri and Thua Thien Provinces. On a trip to survey the new land, he saw the hill at Ha Khe and found that it resembled a dragon’s head raised above the curves and coils of Perfume River, which, in turn, looked like the dragon’s body. 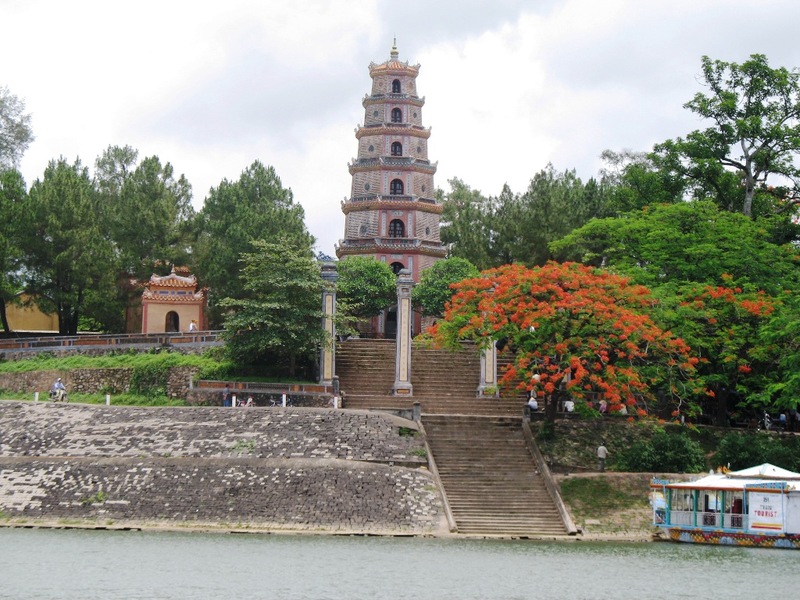 So, Nguyen Hoang gave orders to build a pagoda on Ha Khe and named it ‘Heaven Lady Pagoda’. That is the legend of the famous century-old Thien Mu pagoda of Vietnam, published on the website of the Center for Preservation of Hue Old Citadel. 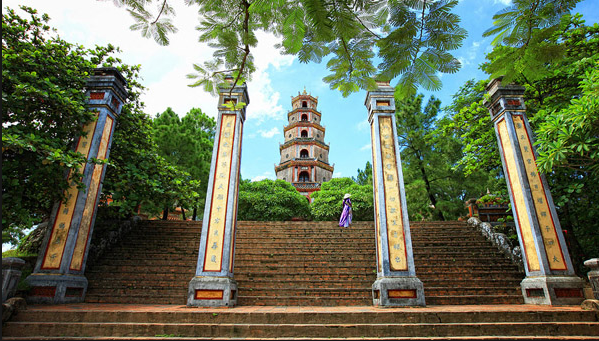 Thien Mu Pagoda is about 4km to the West of present-day downtown Hue, a part of the Hue complex of old citadel relic site, a world cultural heritage. Historians suspect that by asking to be commissioned to the Thuan Hoa frontiers, Nguyen Hoang had already planned for his family line to become regal one day. So, in 1600, as the Trinh family usurped more and more royal power; he secretly seceded from the court. This is considered the time Vietnam was partitioned into the Outer and Inner countries. 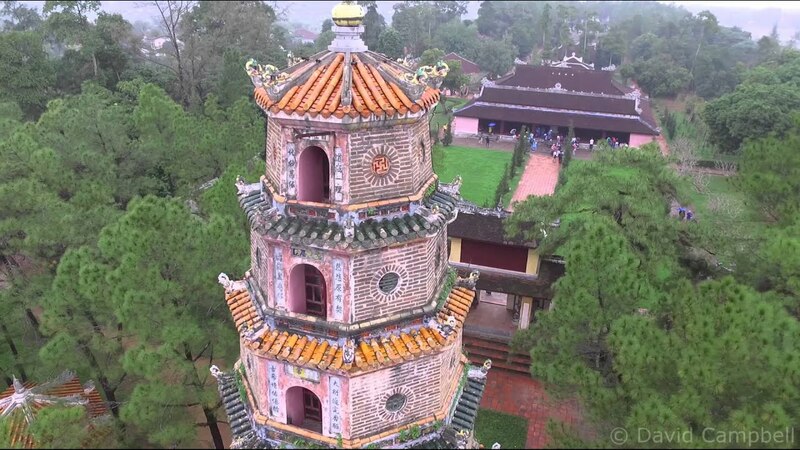 Just a year after becoming the Lord of the Inner Country, Nguyen Hoang built the magnificent Thien Mu Pagoda. He began instituting Buddhism as the national religion of the Inner Country. After Nguyen Hoang died in 1613, his descendants, although preoccupied by wars with the Trinh family to the North of Gianh River (in today’s Quang Binh Province,) continually expanded Thien Mu Pagoda and strengthened Buddhism in the Inner Country. Among the 9 generations of Nguyen Lords, perhaps Nguyen Phuc Chu (1691-1725) was the one who made the most additions to Thien Mu Pagoda. Historical texts show that during the 1710 – 1714 period, the lord ordered a casting of the big bell and built big structures such as Heaven’s King Edifice, Great Bear Edifice, Preaching Hall, the Library, the Monks’ Hall, and the House of Zen. He also authored the eulogy of Buddhist philosophy carved in the big stele on the back of a turtle. 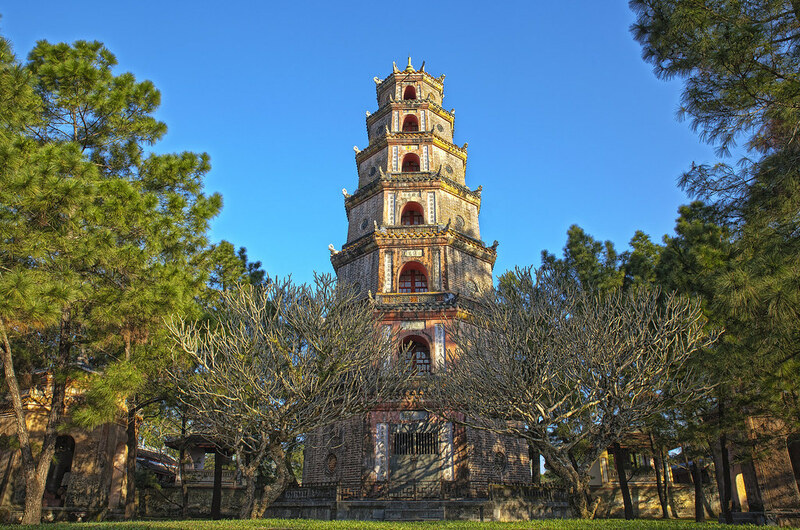 In Nguyen Phuc Chu’s time Thien Mu Pagoda was the biggest and most magnificent in the Inner Country, according to the Center for Preservation of Hue Old Citadel. In 1802, Nguyen Anh, a descendant of Lord Nguyen Hoang, exterminated King Canh Thinh, son of Emperor Quang Trung Emperor, to establish the Nguyen Dynasty, which lasted until 1945. Historical texts show that many of the 13 Nguyen Kings, especially Kings Thieu Tri and Tu Duc, revered Thien Mu Pagoda. In 1844, King Thieu Tri ordered the building of the 21m high Tu Nhan Tower (later renamed Phuoc Duyen) and Huong Nguyen Prayer Hall. He also authored eulogies praising the exquisiteness of Thien Mu Pagoda, carved them on two big stelae and put them near the pagoda gates. In 1862, King Tu Duc renamed the pagoda to Linh Mu, meaning the Holy Lady. The devastating storm of 1904 seriously damaged many structures of Linh Mu. Huong Nguyen Prayer Hall was completely ruined. In 1957, the pagoda underwent a general renovation using modern building materials. Having been through so many additions, restorations and renovations and being always crowded with visitors and tourists, Thien Mu Pagoda nevertheless retains its harmonic tranquillity. Through so many wars, the pagoda managed to preserve the canopy of age-old trees above it, the flowers around it, and so many relics with historical and artistic value such as statues of Dharmapalas, Ten Royalties, Maitreya, and carved words of wisdom. The place of contemplation and meditation of generations of kings and highest priests on the bank of Vietnam’s most romantic river, soaked in the quintessence of historical and cultural traditions, Thien Mu has always been one of the top destinations for Buddhist, researchers, artists, photographers and tourists.